Students will learn many different parts of the face in this unit. Along with the usual games and practice activities, there are also several unique activities featured in this unit. Make a Face: Students can build funny faces by choosing from many different eyes, noses, and mouths. Craft some funny and unique faces together! Clown Coloring. In this activity, students will color the different parts of a clown’s face. They can either color the clown based on what the teacher tells them or they can color it based on their liking and then talk about it. Remember the face: Students are shown a funny face and they must remember the details and then remake that face. Who Am I? Students are shown three randomly colored clown faces. The teacher must secretly choose a clown and then describe it slowly. Students should then identify which clown the teacher is describing. Circle the Nose: Start by choosing a family member or animal that’s already been featured in units 1 and 3. Then, name a part of the face (if applicable) and the students should color it. You can also task your students with finding the correct picture and circling it with a specific color. You may download the unit 4 content here. Now, I have my eyes set on Unit 5: Verbs! This will be coming out May 6th. If you’d like to get an update for when unit 5 is released, you can follow me on Twitter @GriffyHEE. Wellllll, that’s all for today! Thanks for your support everyone. Bye bye! It’s been quite a while since I’ve updated this blog but I have been hard at work preparing a big surprise! The Happy Everyday English curriculum is now live! The key vocabulary for unit 1: Animals. It’s free and packed to the brim with content! This is a speaking first curriculum Students don’t need to know how to read to use this! Designed with Interactive whiteboards in mind. Units are created with specific themes in mind. The two units available now at launch are Animals and Colors. Units contain a variety of different activities and games. Generally around 20 per unit. 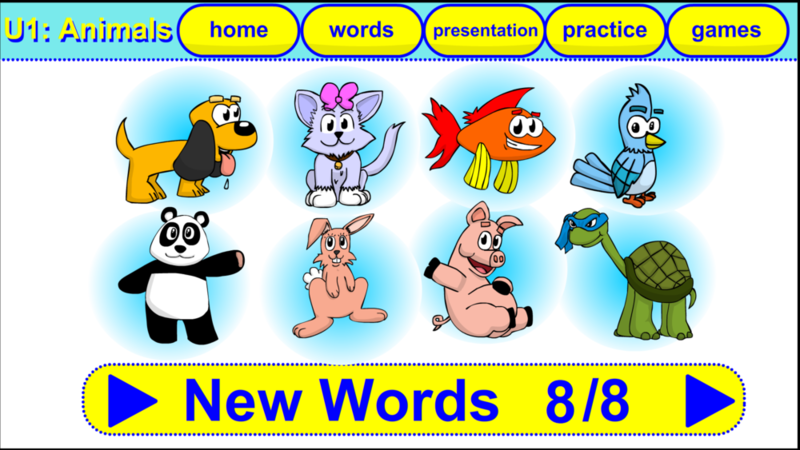 Like the IWB games featured on this site, the content within is completely controlled by the teacher. Can practice keywords with pictures and/or words. Even switch mid-game! Flashcards available for download as well. You can also use these in conjunction with the other games available here at Happy Everyday English. New units will be released bi-weekly. The next unit to be released will be Unit 3: Family. This unit will be released on 4/5/2019. If you’d like to get this and all other units earlier, check out my Patreon here for more information. Tutorials, lesson plans, and tutorial videos coming soooooooooooooooooooooooooooooooon. It’s been an absolute blast preparing these units. You can check them out here. Season’s greetings! I’d like to wish you a Merry Christmas and a Happy Holiday season from Happy Everyday English! Download a free, timed demo of Castle Wreckers now! Welcome! I’m pleased to share with you a link to a timed demo of the Happy Everyday English game, Castle Wreckers. This is a game that has two teams in your class, represented by the adorable cat and dog knights, as they answer your questions for the opportunity to destroy the other team’s castle. Reduce the opposing team’s castle to rubble for victory. Note that, after a short period of time in use, the screen will fade and the game will no longer be playable. I hope that this short demo can give everyone a clearer idea of what to expect from my content. If you are curious about how to play Castle Wreckers you can check out my tutorial video on Youtube by clicking this link. If you have questions, comments, or just want more info, please post below. Thanks everybody! Have a happy everday! Bye-bye!